lEnvironment sound refrigerant HFC-410A of zero ozone depletion potential. lStandard unit with hydronic module (except for 30RB672/802) including all necessary hydronic components, easy and fast installation to save time, space and money. lLow operating sound with no intrusive low-frequency noise, creates a better working/living environment. lElectronic expansion valve (EXV) utilization, several compressors connected in parallel lead to more economical operating cost. 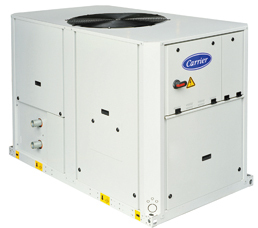 lExceptional endurance tests ensure superior reliability to minimize chiller down-time. - Chlorine-free refrigerant of the HFC group with zero ozone depletion potential. - Very efficient - gives an increased energy efficiency ratio. - Brazed refrigerant connections for increased leaktightness. - Centrifugal high or low-pressure water pump (as required). - Single or dual pump (as required) with operating time balancing and automatic changeover to the back-up pump if a fault develops. - Water filter protects the water pump against circulating debris. - High-capacity membrane expansion tank ensures pressurization of the water circuit. - Thermal insulation and anti-freeze protection down to -20oC by using an electric resistance heater. - A single power supply point without neutral (except for 30RB672/802). - Main disconnect switch with high trip capacity. - Transformer for safe 24 V control circuit supply included. - Systematic factory operation test before shipment. - Quick-test function for step-by-step verification of the instruments, electrical components and motors.